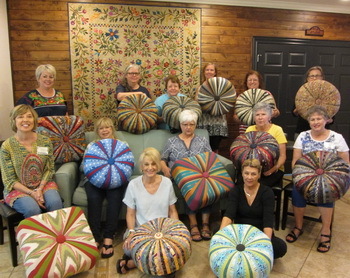 We just finished our August Tuffet Retreat at The Main House in Kerrville, Texas. Creations sponsored this retreat and we had 13 “tuffetiers” as they labeled themselves. 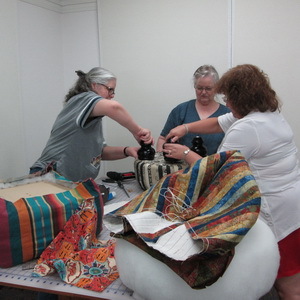 In our retreat there is plenty of time to sew so everyone has the chance to finish their tuffet. We love them all. The fabric choices were so different and each tuffet was so unique. We had two tuffets made from old ties. These gals probably worked longer at home to get those ties ready than they did at the retreat. 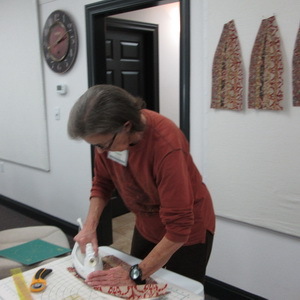 One tuffet was Australian fabrics made to coordinate with a quilt. There was the vegetable dye fabric that looked like the old bedspreds form the 60’s….love that one being a child of the 60’s. We had 3 square tuffets made in this class. There was one from the Australian prints, one from the Serape stripes and one using the handwoven ikats. Each was so different and so wonderful. We are so proud of everyone who attended this retreat and wish them all future tuffet success. 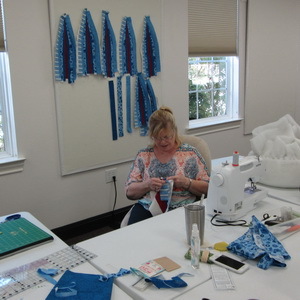 If you want to make a tuffet, you can purchase our kit, pick your fabric and get started. Order the supplies and pattern on our website at Tuffets. We all worked together to complete the tuffets. It was such fun to see them all coming together. Hope you will want to make one yourself.